First I shanked the guy, then I shot him, then I stuffed a grenade down his throat and punched him in the face, then it exploded, and then he died. 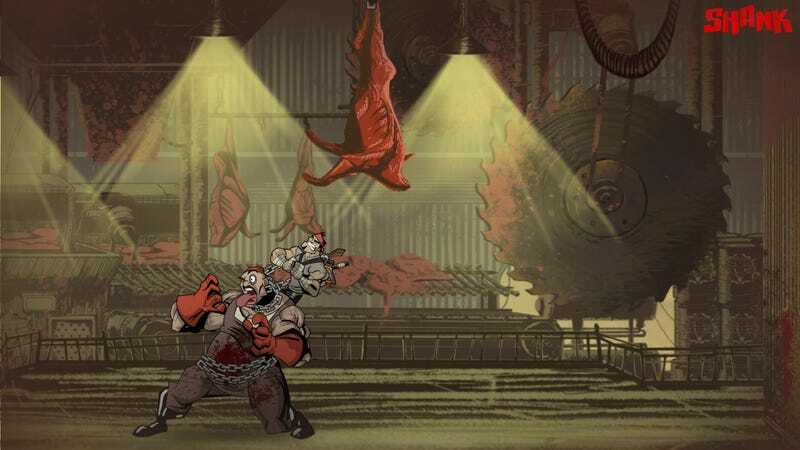 That's Shank, a love note to old-school beat-em-ups and ridiculously long chained-attack sequences. Klei Entertainment's second published game is coming late this summer for Xbox Live Arcade, PlayStation Network and PC download. Klei's being cagey with the backstory, calling it a simple revenge tale. "We're not trying for something epic," Jamie Cheng, Klei's CEO and the game's designer, told me. It doesn't have to be, because you're really going to want to see how Shank moves from attack to attack, with unique, situational transitions animated by Jeff Agala, who directed Atomic Betty on Cartoon Network. For example: after chainsawing a guy to the ground I whipped out my twin pistols and fired cross-arm style; transitioning from a grapple to my gun attack, this time a shotgun, I shoved the guy away, whipped out my boomstick and blammo to the guts. And then there's the grapple-grenade attack described above. Guns are circle (or B), knives are square (or X) and the chainsaw at triangle (or Y) is sort of a wildcard slot that Cheng said will be swapped out for other, badder weapons later in the game. Chainsaw is, as you might expect, a slower melee that deals much more damage. Shank's attack chain will end if you just spam a single button, so while it's super effective when you're hanging from a pole blasting at a single foe off screen, you'll find yourself caught in a reload if whipping out the guns is your go-to-move with a lot of guys on the screen. That said, you can transition from attack to attack theoretically infinitely, provided you haven't gone to something your foe can block. Or he isn't dead yet. I played Shank on an easy setting with some guidance from Cheng; all weapons, once you have them, are infinite use and will respawn with you after you lose a life. Cheng said the game is built to allow all of your moves no matter where you are in the game, whether that is shimmying on a rope, hanging from a ledge, or jumping into the fray. Even simply running toward a foe and pulling out my sidearms turned into a dashing-blasting Matrix-style attack. If I had any complaint with Shank, the gun attack seemed to stick with its particular firing direction - in my case, inconveniently, down - for a bit too long. The rest flowed easily and the game gives you plenty of time to wonder "What if I try this ...?" and then see it happen. The whole thing is rendered in a wonderful graphic-novel style that in high-definition is like a comic book come to life. We're promised tons of cut scenes and dialogue - written by Marianne Krawczyk, the writer on God of War. At harder difficulties the game will require more thoughtful use of your parry, and approaching enemy types with the proper attack to exploit their weaknesses. The game's hardest of five settings will have no checkpoints, requiring you to complete an entire level in one life. Shank's built to offer four to five hours of action, plenty for a downloadable title. No specific release date or price has been mentioned, but Cheng said the game has just begun its certification process with publisher Electronic Arts. "We built the game with two things in mind," Cheng said. "What are people expecting, and how can we surprise them? I think people will look at the story, look at the game, and say, 'Wow, they really put that in the game?"